Okay, so this is a comic, based off an amalgamation of obscure references. The image was drawn in my sketchbook with a mechanical pencil and staedtler ergosoft coloured pencils. The comic appeared originally as a Lightning Made of Owls comic. This is a Mezzacotta project run by David Morgan-Mar, where anyone can submit comics, so long as they use the website's shortlist of characters (which the community designed). The comic appeared there without explanation. Readers of LMoO, are likely to be familliar with Ryan North's excellent Dinosaur Comics. 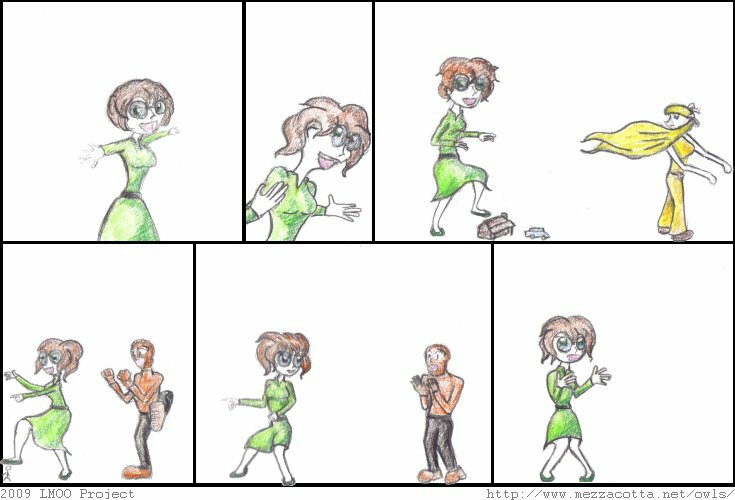 This is a webcomic that uses the same (deliberately awful) image for every comic, changing the text alone to tell different jokes and stories. A quick look at this website should hopefully explain the comic that I drew.